Rob frosted the skull and crossbones--a masterpiece! On Saturday at 4:00 I had my long-awaited Halloween baking party. Yes, I know. It’s not even October yet. But our family starts getting excited about Halloween in July! So this party seemed a long time coming. I spent all day Saturday getting ready, which was just fine by me—because the preparation is always half the fun. I got to buy Halloween candy and pot chrysanthemums and pop popcorn and put up all my Halloween decorations. I had a terracotta pumpkin on the front porch and a real pumpkin on the back steps. 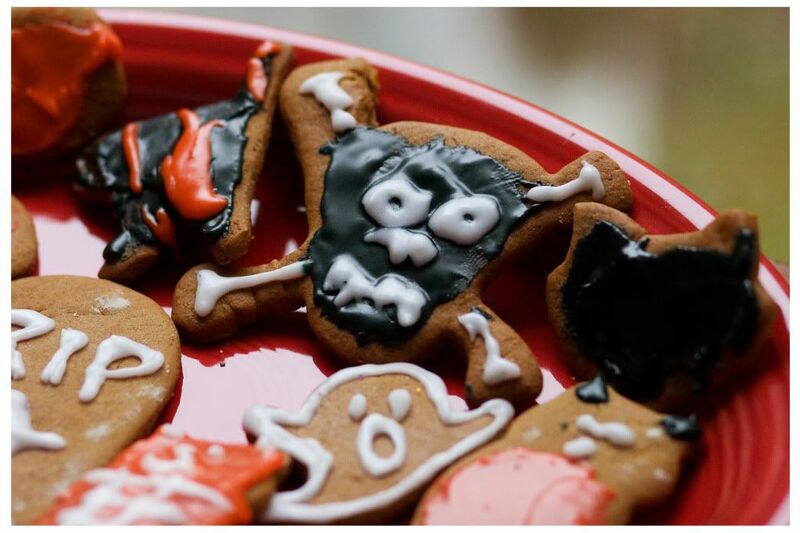 There were garlands and candles and fake spider webs and bowls of candy—and a shadow maker! I set up our game table in the “library” (really the back half of our hall) for fortunetelling. 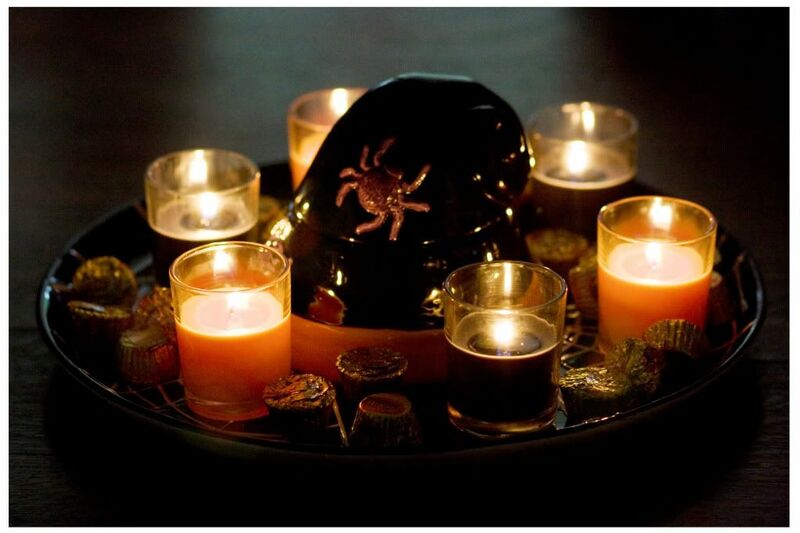 I put my witch hat-shaped platter in the middle and filled it with black and orange votive candles and glinting gold-wrapped Reese’s peanut butter cups. I got out my Halloween tarot cards and Gypsy Witch fortunetelling cards and all the scary books and games I could think of. Rob and I were having so much fun. We made gingerbread cookie dough and put the dough in the refrigerator to chill. 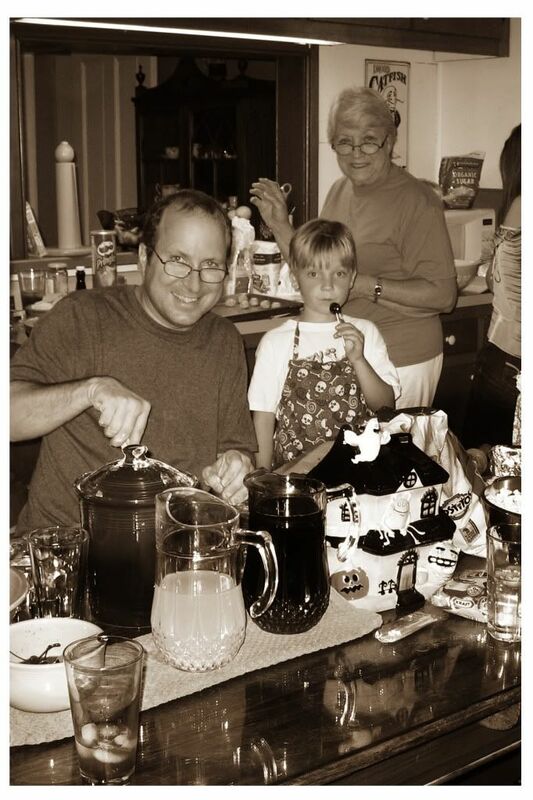 Then we made iced tea, and limeade with maraschino cherries. We turned off the lights and lit the candles. And we made plans to tell the kids we had a ghost, a little-boy ghost named Phineas. The guests were the usual suspects: Mom, Kris, Bun, Sophie, and Jake. 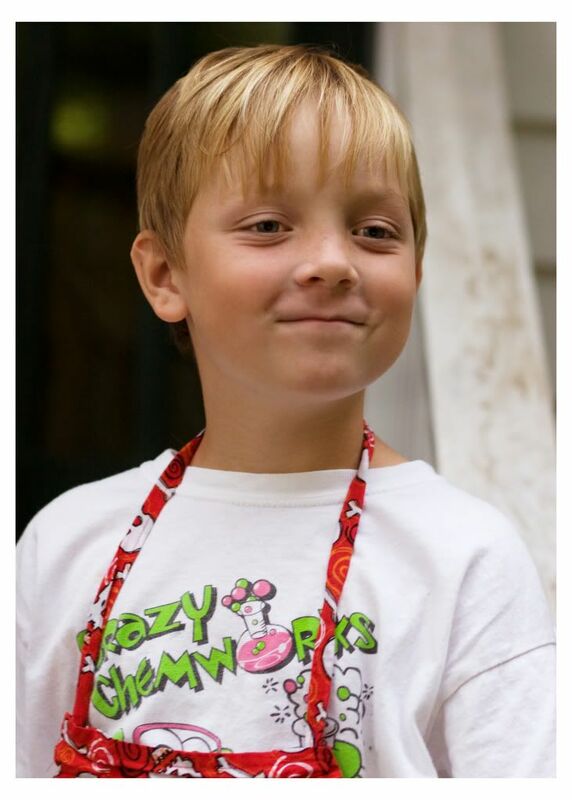 Jake wore his red skull-print apron (handmade by Mom). 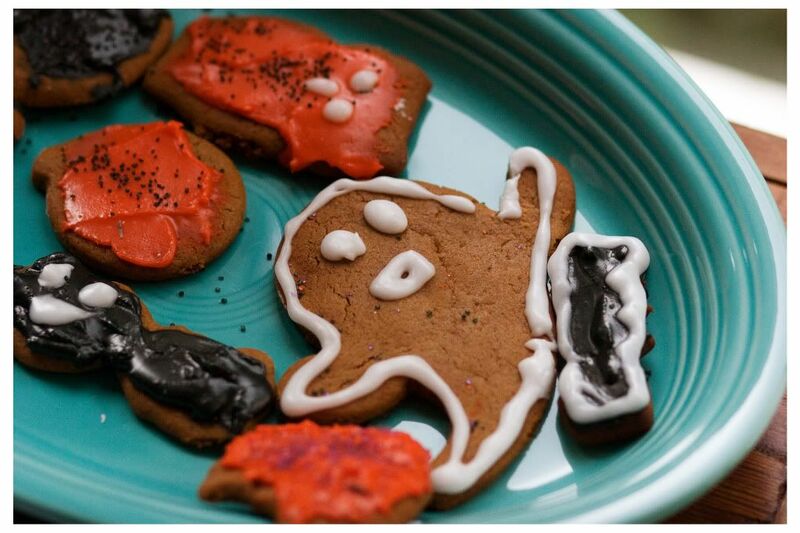 What could be better for a Halloween baking party? My apron was pretty appropriate too—it’s orange with black cats. Sophie was wearing a sequined tank top and an assortment of new duct tape bracelets. Apparently duct tape now comes in a variety of decorator colors and prints, and kids are making bracelets out of it. This was news to me. Sophie even brought some extra rolls of duct tape with her to the party. She ended up making me the most awesome zebra-print one. Everybody was baking something different. Rob and I were baking gingerbread cookies. Bun was making carrot cupcakes. Mom was making pecan balls. And Mom assigned Kris to make some awesome caramel-peanut candies. It was this weird old can of mixed nuts that Mom had had forever and wanted to use up. She always does this! She tries to force you to consume her old outdated food. That is her favorite thing to do—to guilt you or otherwise trick you into eating weird old expired food products. I am serious! Kris obeyed Mom’s orders. She sat picking through a can of mixed nuts, scavenging for peanuts. “Peanuts are sure hard to come by in here,” she said. She picked through the whole can and came up with about two peanuts. It was mine, actually; I had bought it that morning and meant to put it out for a party snack. Rob found a can of peanuts in the cupboard. “Here,” he announced. “Peanuts. They actually sell them in their own cans these days, you know.” Then he said to Kris in a stage whisper: “If your mom tells you to do something, just . . . don’t do it.” We love teasing Mom. Even though he was decked out in his awesome skull-print apron, Jake is really not one for baking. “I’m going to go run around,” he announced early on. “I thought we weren’t going to mention it,” Rob said in another stage whisper. “Some strange things have been happening around here lately,” Rob said. “What?” Jake said. His eyes were so big. “Why?” Sophie cried. “Why do you think that?” She and Rob were sitting at the kitchen table, rolling out the cookie dough and cutting it into bat and broomstick shapes. Sophie was quiet. Maybe she even shivered. It was getting darker and darker outside. There was lightning, and rain pelted the windows. “What did the papers say?” Jake asked. Jake and Sophie looked closely at Rob’s face. “Phineas scratched you?” Jake said. There was a crack of thunder. “I want to go home!” Jake cried. So we all started comforting him and backpedaling and saying we were just teasing. But Jake wanted it to be true. He wanted to keep talking about Phineas. And yet, he and Sophie were really scared! When we started frosting gingerbread bats and tombstones, Jake didn’t want to sit in certain spots because he’d be too close to the shadowy dining room. He made Kris sit between him and the dining room so he’d be protected. “No! I don’t want to sit over there,” he cried. But he was fascinated by Phineas, and he wanted to keep talking about him. He was completely engaged. “Where does Phineas live?” he asked. This was so funny. She was talking about my beloved doll, Amy, who is about four feet tall. She was my favorite doll when I was a kid. Kris and I loved her so much that Mom bought a really expensive replica of her for Sophie before Sophie was born. Mom has never given Sophie the doll, or even shown it to her, because Sophie “doesn’t seem interested,” as Mom says. “That is sad,” Kris said. “I want to see Leslie’s closet!” Jake cried. “I never got to see it!” So Rob took Jake to go peek in my closet. Jake thought it was very scary. The inside is all brick and unfinished plaster, and the ceiling is about 15 feet high, with exposed beams. Then Rob and Jake sat at the fortunetelling table, in the shadows, and consulted the Magic Eight-Ball on Rob’s phone. Jake kept asking the Magic Eight-Ball questions about Phineas: “Magic Eight Ball, does Phineas live in Leslie’s closet?” he said. The rest of us were still in the kitchen frosting and baking, and Rob and Jake sat in the dark, spooky library (I’m going to persist with calling the back part of the hall “the library”; maybe it will catch on). Rob and I had given Jake a Hot Wheels car, and Jake had it with him at the table. Mom said (his grandmother said! ), “Somebody needs to go steal that Hot Wheels car and say Phineas took it. Hide it in Lez’s closet!” She was whispering, snickering. It was so cute. I love it when Mom gets into the spirit. So, Kris sneaked in and stole the Hot Wheels car while Rob and Jake were distracted by the Magic Eight Ball. She ended up hiding it in the scary primitive cabinet in the kitchen. “I didn’t touch it, J-Bomb,” Rob said. Meanwhile, Mom, Bun, Kris, and I were giggling in the kitchen. Jake kept talking about Phineas throughout the entire party. Most of the time he didn’t seem scared; he just seemed really fascinated, really taken by the idea of the little-boy ghost. Jake asked the Magic Eight Ball on Rob’s phone if Phineas existed. The Magic Eight Ball said no. Kris’s Phineas voice was quite frightening. “Now I’m getting scared,” Rob said. It was raining and thundering and lightning. It was the perfect night for a Halloween party. Jake and Sophie were too scared to go into any of the rooms that were dark, but that was fine. There was plenty of frosting that needed to be done in the bright, cheerful kitchen. Sophie was so good at using the piping bag; she made some awesome ghosts and tombstones. I only frosted two cookies, and they both looked like the work of an untalented three-year-old. Bunny's cupcakes turned out so cute, topped with candied ginger and little black flags decorated with grinning skulls. Of course, Mom's pecan balls were perfect, nestled in Halloween-print papers. And the caramel candies were awesome too. "I feel so fat," Kris said. "I haven't eaten one single healthy thing this entire day," I said. Next Bunny told us about a neat/scary dream she had recently. It involved a cemetery surrounded by a moat. The cemetery was very Victorian and romantic, full of marble angels and lambs. And Kris and I were there, but we were young, dressed in our old ‘80s way, in vintage velvet dresses and fishnets. A bunch of our old punk friends were there too. And all the punk kids were diving into the moat and coming up with broken fragments of old monuments—angel heads and marble hands and crosses. Bunny had so many beautiful details that I can’t remember now. . . . I hate how bad my memory is. That’s why I have to write everything down. It took kind of a long time to tell about the dream (about a minute), and Jake got a little bored. “Stop talking, Bunny,” he said, but in the jolliest way. And we went about the business of finding cats to play with. Bunny got to see Carl! He's so cute, but he usually hides when people come over. Yet this time he came out for a brief moment, and Bunny got to see his gigantic eyes and his short face and his perfect stripes and his yellow belly and his black-bottomed feet and his little bulldog-shaped body. He is adorable. “What were you guys doing?” Sophie asked when we came back in the house. Sophie was too scared to have her reading done by candlelight. But she wouldn’t admit it. “The candles hurt my eyes,” she said, rubbing them melodramatically. So we had to switch on the overhead. I got to overhear just a bit of Jake’s reading. It was so hilarious: “This card represents your past, a period you’ve left behind,” Bunny said. “Your card includes a strong female figure, so perhaps this card signifies a period of intense mothering that has now ended for you. . . .” How perfect for a seven-year-old! But I don’t think Jake even sat through his whole reading. He went in the living room (despite all the scary ceramic ghosts and monster heads on the mantle piece) and started watching some sort of kids’ show with my enormous cat Jammer in his lap. We decided to play a game of Clue, which is one of the Kimel family’s very favorite games. We used to play it all the time back in the ‘80s, when I was about 17 or 18 and Bunny was seven or eight. Our brother, Jacob, would play too, and we’d all be laughing and laughing. It was so much fun, sitting at the big kitchen table. I wish I’d written down the jokes, because now, of course, I can’t remember them. We all looked at her, laughing. “You mean in general?” I asked. “She does remind me a little of Miss Marple,” Rob said. And Bunny started really hamming it up after that. “No, I am going to win,” Jake declared. Jake plays like I do in Clue—making wild guesses based on nothing. Early on he was itching to make an "accusation," which is the final play of the game. Instead, he ended up taking a break and going and watching a little more TV. Kris and Jake did end up making an accusation in the end. “It’s Miss Scarlet in the hall with the revolver,” Kris said. “Good job, Leslie,” Sophie said, rolling her eyes. “Leslie ruined the game!” Rob teased. “Yeah!” Jake said. “You ruined the game, Leslie!” He loves to copy Rob. I am indeed the worst game player ever. I never can concentrate because I'm too busy laughing. It was time for the guests to go home. It was almost nine and pitch dark. Sophie went around to the various pumpkin-shaped bowls and started filling her pockets with candy for the road. “But where’s my Hot Wheels car?” Jake cried. "I want it!" Kris whispered to Rob what she had done. Jake found his Hot Wheels car in the cabinet. He was dazzled, dumbfounded. But he was also terrified now to go out to the car in the dark and the rain. He wanted Kris to carry him. Apparently Sophie was really scared too, and during the ride home she started scheming to sleep in Kris’s bed that night. Sophie made this great ghost. Go, Sophie! 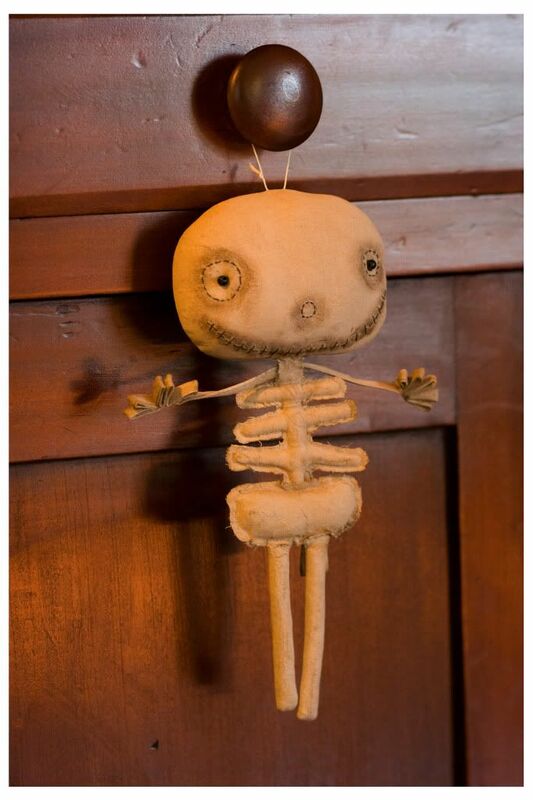 I love this baby skeleton!